Here's how you can enjoy your deal! If you haven’t already heard, the sakura flowers are expected to bloom even earlier than it did in 2018. Find out when and where you can catch these sakura beauties in action! As we approach the upcoming springtime and await the budding of the much-coveted cherry blossom trees, it’s time to get those travel planning ready. Find out the best places and forecasted dates to ride on the sakura madness train! If you’ve been dreaming of a sakura wonderland, Taiwan is also an amazing destination to consider. All through April, cities all over the country are lined with cherry trees – and we’ve got the lowdown as to when and where you should be going for the ultimate sakura treat. The promotion code "KLOOKGSS15" is valid for redemption till 30 April 2019. Promotion code “KLOOKGSS15” entitles users to S$15 off all Klook activities with a minimum spend of S$200, excluding the Klook Gift Card, JR Pass, Universal Studios Japan Admission Tickets and Express Passes. Promo code is applicable to Singapore users only. Terms & Conditions for "KLOOKGSS35"
The promotion code "KLOOKGSS35" is valid for redemption till 30 April 2019. 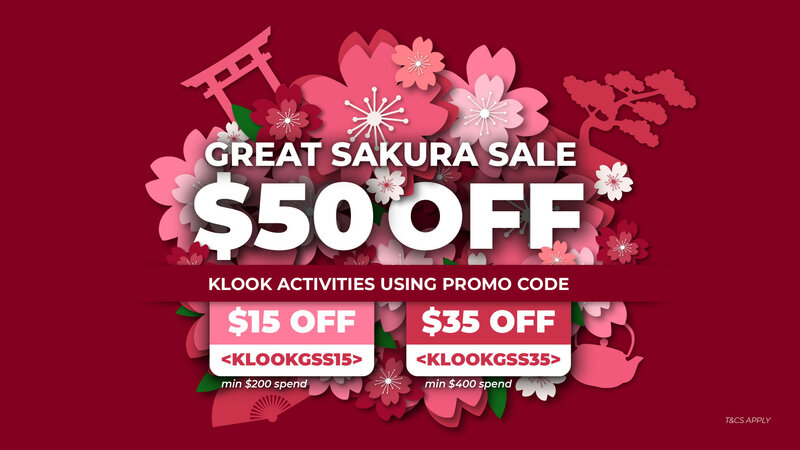 Promotion code “KLOOKGSS35” entitles users to S$35 off all Klook activities with a minimum spend of S$400, excluding the Klook Gift Card, JR Pass, Universal Studios Japan Admission Tickets and Express Passes. The promotion code "KLOOKGSSDBS” is valid for redemption from 11 March 2019 to 31 March 2019. Promotion code “KLOOKGSSDBS” entitles users to S$30 off all Klook activities with a minimum spend of S$300, excluding the Klook Gift Card, JR Pass, Universal Studios Japan Admission Tickets and Express Passes. Promo code is applicable to Singapore users with Singapore phone number only. Payment must be made with a DBS/ POSB card to enjoy the discount.